If you are looking for an entry for the 2019 race, unfortunately we can no longer add any more charity runners unless they already have an entry to the race. The Bank of America Chicago Marathon is the pinnacle of achievement for elite athletes and first-time marathoners alike. We thank the individuals who have run in the past few Chicago Marathons as part of Team Apna Ghar. They joined runners from all 50 states, more than 100 countries, and over 10,000 other charity runners to accomplish a personal dream by reaching the Chicago Marathon finish line in Grant Park. We are now gearing up for the 2018 race, that takes place on Sunday, October 7, 2018. Online registration is closed and we are unable to accept any more runners who have not already received an entry in the race. Want to Guarantee Your Entry for the 2019 Bank of America Chicago Marathon? Registration for the 2019 Bank of America Chicago Marathon will be conducted through a system of guaranteed entries and non-guaranteed entry application process. The fee to register is $195 for U.S. residents or $220 for those residing outside of the U.S. The field will be capped at a maximum of 45,000 participants. As an official charity partner, Team Apna Ghar has a number of guaranteed entries. By joining Team Apna Ghar and committing to fundraising a minimum of $1,250, you will be able guarantee your entry in the 2018 race. Interested participants will only be able to register any time from October 23, 2018 - November 29, 2018. We are unable to accept any more runners through the charity guaranteed process at this time. If you receive an entry through one of the other guaranteed entry opportunities or through the non-guaranteed entry application process, you can still join Team Apna Ghar. Please note that we cannot accept runners who do not have an entry beyond November 29, 2018. By joining Team Apna Ghar, you will be able to take advantage of our team benefits. We do ask you commit to fundraising for Apna Ghar. *Upon registering, you will be sent a Team Apna Ghar Fundraising Kit to help you with your fundraising efforts and we have a team page set up on Crowdrise to easily share with your friends and family. All Team Apna Ghar runners are required to submit a commitment form. 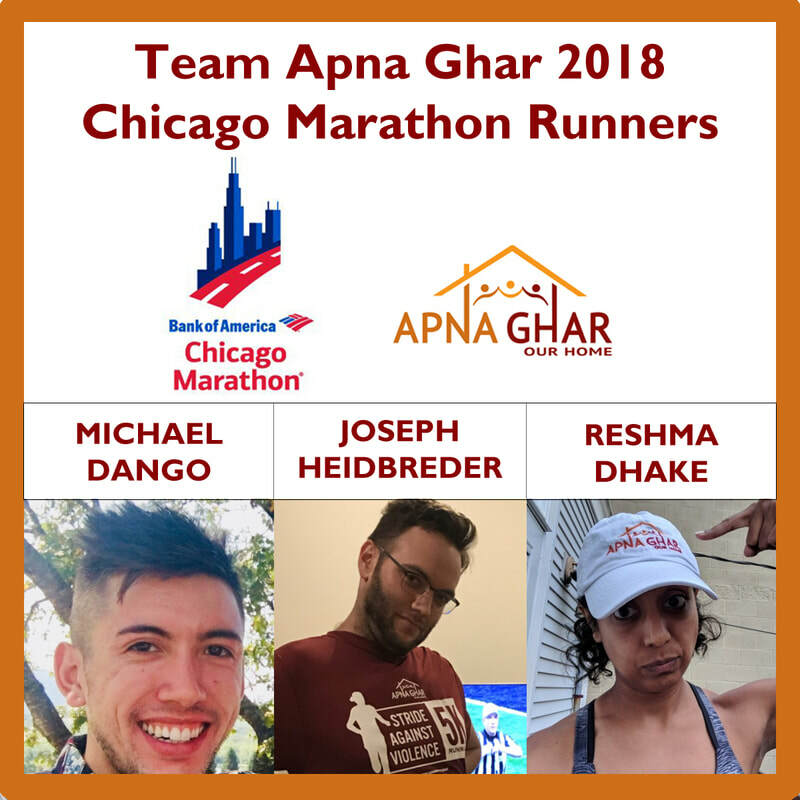 Runners seeking entry into the Chicago Marathon through Team Apna Ghar will not receive a registration URL until a signed commitment form has been returned to the Team Apna Ghar Coordinator. Fundraising $1,250 may seem like a daunting goal, but anyone can do it. Think of it in terms of asking 12 people for $100 each or 25 people for $50 each. Many people would love to support your participation in the Chicago Marathon and what better way than running to end domestic violence. There are many ways to go about asking for donations, including emails, phone calls, posts on social media sites, hosting small fundraisers, asking for donations as birthday presents, or more, and we're here to help you reach your goal! We will provide you with a fundraising kit to help with your fundraising efforts and we are available to answer any questions and help you with ideas for your fundraising efforts. WHY RUN FOR TEAM APNA GHAR? Domestic violence is a global epidemic that knows no boundaries. In the United States alone, one in four women will experience domestic violence in her lifetime. For the immigrant women Apna Ghar serves, domestic violence is especially isolating as they have less access to legal, social, and other support services and networks. Apna Ghar's programs and services are funded through generosity of individuals like you! By joining us and mobilizing others to support your participation in the Bank of America Chicago Marathon, you are raising a chorus of voices to support survivors who are reclaiming, renewing, and rebuilding their lives. ​Thank you to our 2018 marathon runners Michael Dango, Joseph Heidbreder and Reshma Dhake! 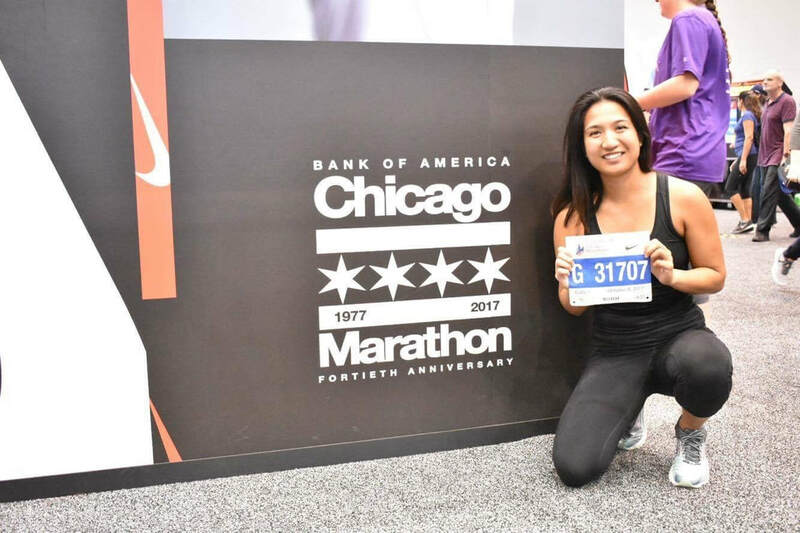 ​Thank you to our 2017 marathon runner Megan Reyes! ​Thank you to our 2016 marathon runners, Anila Khoja and Sabin Juma!